The end. And thanks for coming mmkkay baiyyyy! Kidding. I should – WILL – stop obsessively eating this beautiful bowl of fried plantains, black beans, seasoned rice, and garlic cilantro lime slaw for at least two seconds so I can share the spicy, creamy, burrito bowl wealth with you in its internet form. I’m not even trying to say that you should fall in love with it as hard and fast as I did, or that every person who reads this blog will like to smother their food in a garlic cilantro lime slaw and that leftover creamy sauce – I’m just letting you know that, for me, this combination is EVERYTHING. These Spicy Brazilian Burrito Bowls are comfortably sitting in the Top Recipe of the Year place in my food blogger mind. 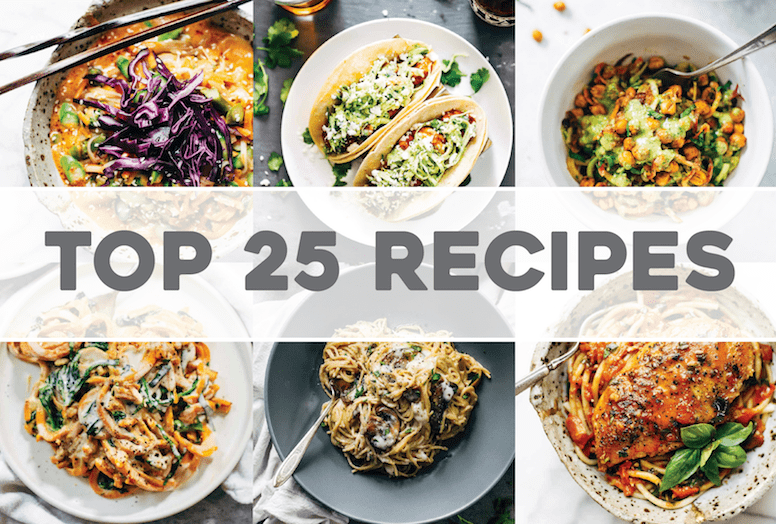 I make a lot of recipes every year – some really super good, some bad, some legitimately frighteningly bad. But all that sort of fades away when I have this bowl in front of my face. Seriously, it’s the best thing I’ve eaten all year. Don’t give me a lot of time to think about that because I might be visited by a Ghost of Recipes Past and be forced to withdraw that bold statement. No, just let me have a strong, unshakeable statement for once in my Minnesota life. Alright. I’m going to come clean about the story behind this recipe in list format ready go. Part 1: Bjork and I went to California not too long ago. Okay ummmm it was a while ago. Maybe I’m slow. I ate delicious food and, in an effort to collect food-inspiring memorabilia, I snagged a menu from a vegan restaurant called Sage (♡) knowing that its fantastic recipe descriptions would inspire me to near-vegan greatness. There were strong feelings involved because I am a wannabe vegan. And SAGE. Part 2: I found the Sage menu when cleaning out my desk, like, ten years later. But inspiring food is still inspiring food, so I opened up the menu and circled 90% of the dishes that sounded re-create-able. Starting recipe: Brazilian Burritos. The Brazilian Burritos involved mole sauce. Do you guys know/make/eat mole sauce? I thought I did, but then I made it and poured it all over my burritos, and found out that, in fact, I do NOT like mole sauce. Either that, or I got a little heavy handed with the chocolate. <– 99% likely. I rarely have a fail so bad that it finds its way into the garbage, but alas. You can’t win them all. So long, mo-lay. Part 3: I just couldn’t leave the Brazilian Burrito theme alone, so once the house stopped smelling like an overly chocolatey mole sauce fail zone, I decided to try again. This time with a **tried and true** sauce that you may remember from these shrimp tacos. Also: arranged in an actual container from Chipotle because it’s not ever going to be a REAL burrito bowl without one. Part 4: A few hundred fried plantains and a gallon of sauce later, I found myself swooning over this bowl-o-love that features them golden crispy plan-taters, black beans, crispy-creamy cilantro lime slaw, and seasoned rice. And just like that, Spicy Brazilian Burrito Bowls were born. In full disclosure, I’m talking to you about Brazilian Burrito Bowls today from the steamy locale of New Orleans, Louisiana! I am sort of loving the humidity, which is exactly the sort of naive we-don’t-live-here statement I used to hate coming from people when we lived in the Philippines, but here I am, being that girl, pretending like I love humidity for a hot second. I don’t know – it gives me bad hair excuses. It requires the wearing of a cute summer dress. It just feels good. Also feeling good to me are the oysters and fried shrimp that are resting nicely in my belly. Except not the oysters – I chickened out last minute. 🙈 And then my food snob spirit was crushed by my real self. Besides oysters (unless you are the person who can convince me that putting a weird, slimy, grey-ish, goobly-goop shellfish alien creature in my mouth is going to be a likable experience), what else do we need to be eating in NOLA? Hurry up plz – we have, like, two minutes before we go home. Now. SPICY BRAZILIAN BURRITO BOWLS FOR EVERYONE! 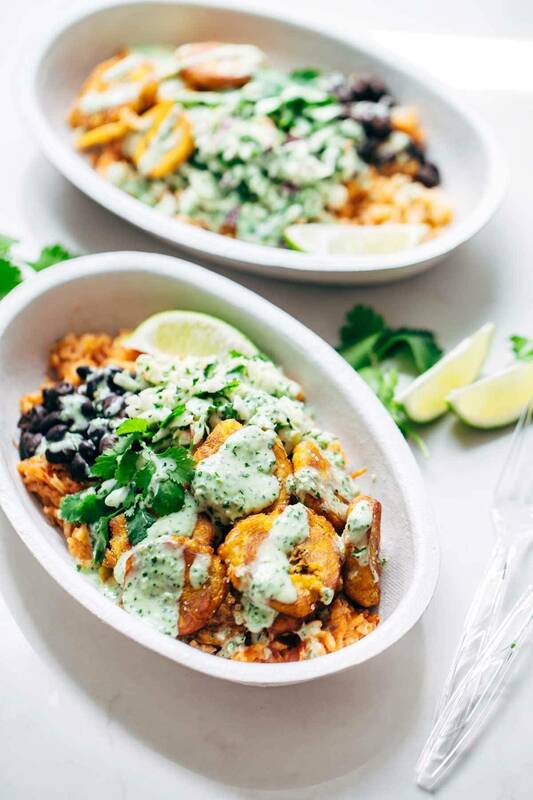 Spicy Brazilian Burrito Bowls recipe featuring seasoned rice and beans, garlic cilantro lime slaw, and crispy fried plantains. So good // almost vegan. Rice: Place the ingredients in a rice cooker and cook until done. Black Beans: Heat the black beans with the spices in a small saucepan until warmed through, adding a little water or oil as necessary. Keep heat on low to keep warm. Slaw: Pulse the oil, water, green onions, cilantro, garlic, salt, lime juice, and Greek yogurt in a food processor until mostly smooth. Toss the cabbage with enough sauce to coat – reserve the remaining sauce. Assembly: Serve a scoop of rice, beans, and slaw into the bowls. Add the plantains on top with a few cilantro leaves. Drizzle with extra sauce. DEVOUR. The slaw is the one element that should not be tossed together until you’re ready to serve. If making ahead, just save everything separately in the fridge and toss the slaw together just before serving. To make this vegan, sub the Greek yogurt in the sauce with a vegan alternative or just use a little more oil to make it more like a dressing. Update 7/27: Just in case there was any confusion, there are no claims of authenticity for this recipe. It’s a fun, creative food combination inspired in both ingredients and name by a dish I saw on a restaurant menu. Dat’s all. Making this PRONTO…or realistically…when I locate plantains in middle Georgia. Out of curiosity, where do you shop for most of your groceries? I’m in Prior Lake and haven’t been able to find a few of the things in your recipes at Lunds. Hi, Mary! Lindsay does the majority of her grocery shopping at Target or Cub. My mind is totally blowing right now. I LOVE this idea, and I can’t wait to try it pronto! Thanks Alexa! hope you like it! I can only imagine how good these are! I made plantain and black bean tacos recently and they were delish so I know these would be. And that sauce….. dead. Oysters are totally scary and weird, but I accidentally ate some fried ones a few weeks ago and it was unbelievably delicious (and scary and weird)! Go that route if you can. And eat some beignets! I also have never tried plantaines, maybe its because im from the uk. i shall keep an eye out. Yes! definitely do. They are divine! I love this idea so much! Who needs meat with all that good stuff in the bowl? On the subject of mole, I used to hate it because it’s so strongly flavored, but then I learned to love it when I was teaching in TX and one of my kid’s moms would bring me her homemade version, which was so good. I’ve made it but it has about a thousand ingredients, and tastes way better after sitting in the fridge for a day or two…just seems like a lot of work to put in a burrito. This garlic cilantro sauce looks just as amazing to me! P.S. I also weirdly enjoy smotheringly hot, humid weather. Hope you have an amazing time in Nola! Oh yum! My dad grew up in Brazil so we used to have beans and rice for dinners regularly. I thought it was the most delicious, simple meal. This recipe is bringing back those memories. I am going to have to make this for my family now. It looks like a hit! That’s awesome! Thanks for the comment Chelsea! This looks SOOOOOOO GOOD. I definitely want to try making this! Thanks Kelly! Hope you like it! ME TOOOOO especially dipped in this sauce! This looks absolutely delightful! I love the colors and all the excitement around it! I’ll have to try this out because I’ve never made plantains at home, but this looks like such a delicious reason to start! yes, you must start! so crispy and delicious! Sometimes menus might not be the best source of knowledge about a country’s cuisine, especially a cuisine as misunderstood as Brazil’s. I lived in Brazil for quite a few years and aside from the fried plantains in the recipe, Brazilians don’t eat this. Or anything like it. First and foremost, burritos are not Brazilian. They are Mexican. When in Brazil, you can basically only find burritos in Mexican restaurants, which are infrequent at best. Even in regards to the original inspiration, molé is Mexican and is essentially absent in Brazilian cooking. Cumin and chili powder are also virtually unused in the overwhelming majority of Brazilian homes and you will never find them in beans, which are typically served unsalted and as a side for rice and greens or as part of a feijão. Brazilians do not prepare rice in the fashion described, either. A very few Northeastern Brazilians make a very distant cousin of salsa, but it is rare anywhere outside that region. Brazilians have almost no spicy food. Throughout the North, Southwest, Midwest, Southeast and the South, a spritz of black pepper is enough to send people begging for the spiciness to stop. As a last note, slaw is distinctly European, though in Paraná through Rio Grande do Sul you’ll find people who make it due to the European (particularly German, Italian, Polish and Ukrainian, though the Ukrainians don’t make much slaw) heritage of the people there. That said, most of the Brazilians who do make it are of Polish heritage and as such produce a slaw with onion, green pepper, carrot and, surprisingly, sugar alongside the cabbage. Very different than the preparation found here. In other words, I’m not exactly sure how this qualifies as a Brazilian burrito when it in large measure does not identify with Brazil. The pictures are GORGEOUS, the cooling impact of cilantro is perfect for summer and it seems to be very healthy. Plus the fried plantains (which ARE very Brazilian) look like they were done exactly the way they do them in Brazil. It might be a good idea to research a country’s cuisine before putting labels on recipes, though. I’m sure that you meant nothing malicious by it, nor did the restaurant that inspired the dish. Absolutely right Wilson. I also live in Brazil. In Lindsay’s defense, I don’t think she meant that this was a Brazilian dish. It’s kind of a fusion of flavors with a little Brazilian influence from the main ingredient of tostones. The rest is in fact “Mexican” influenced which is why the Chipotle paper bowl is used. We have a restaurant here in Scottsdale called Sumo Maya. They serve Japanese influenced Southern Mexican food. So to sum it up, I didn’t get the impression that she was trying to pass this off as authentic Brazilian food, but rather a fusion creation of flavors inspired by a vegan restaurant she once visited. Tostones are not popular in Brazilian cuisine, Andrea. As a brazilian, born and raised, I went like crazy to see what Lindsay had prepared for “us” this time. Rarely I torn my nose for some ingredient … but got a little sad, have to admit, because whatever this dish has, it’s a Mexican recipe. Brazilians eat, definitively rice and beans ALL the time, but white and black respectively. In some parts of the country, they use to have some sort of “sweet” as BANANA, not plantanos, even though on the Northeast they fry the salty green bananas but … with sugar and cinnamon. And ALWAYS, a piece of meat … chicken, linguica (sausage), beef (for sure not tenderloin). With this wave about “healthy”, they are serving tofu as protein … healthy my “patushky” because 95% of the tofu produced today is make with soy that was plant/grows using GMOs seeds. But this is another discussion. And old “school” like me, we call MEAT, not PROTEIN. BEEF is BEEF … edamame is … well … the thing that is served at japanese rest. There is not such thing “starch and starch” … it’s RICE and POTATOES. But HEY! 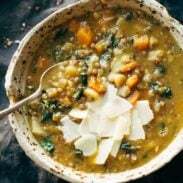 Amazing recipe … amazing taste … amazing pictures! I meant SHE … not HE. Thanks Wilson – I definitely didn’t mean to make any authentic claims here. Without knowing much about Brazil’s food, I just assumed that the burrito part was Mexican-inspired and the plantains, rice, and beans were Brazilian-inspired, and therefore it became somewhat of a creative mashup (and not even my creative mashup, at that, since it was inspired by a restaurant). I appreciate you shedding some light on the food in Brazil! Who cares! It looks delicious! The fried plantains are called tostones and are from the Caribbean, but again, who cares! Thank You!!! I’m Brazilian and isn’t such a thing as Brazilian Burrito. The food looks amazing but we don’t eat burritos. I believe burritos a Mexican food. While in NOLA, have beignets, a muffaletta sandwich, and some FRIED oysters (not so gloopy that way). Enjoy! Good call on the fried oysters! Your photos get me every time. This bowl looks so flipping perfect! Thanks Katrina! I appreciate that! You must must MUST go to Liuzza’s by the Track for their BBQ shrimp poboys. Because to them, Cajun BBQ = marinated in butter overnight with heaps of fresh black pepper and thyme. Girl.. just. Just go. I beg of you. BEG. Stop. stop it. marinated in butter? STOP IT. I’m so glad you are enjoying your travels! I was in NOLA for spring break and it was my food-cation. So fabulous! Best place: Willie Mae’s Scotch House. Best Fried Chicken and Best Red Beans and Rice. It’s a little house off the beaten path, but that doesn’t stop the line running out the door. FAB-U-LOUS! They are even featured on Food Network. Great place and a really humble group of people. Let me know what you think if you go! How fun! Thanks for the tip Brittany! This looks and sounds amazing, Lindsay! Starting with BAKED oysters, is my advice. They’ll cover them with melted cheese and other goodness and then you can add cocktail or tabasco sauce (Or both. Recommend!) and eat them on crackers and by the time you fall in love with them THIS way it’ll be impossible to imagine NOT trying them fried and also RAW with a side of good beer because YUM. Trust me!!! Oh my gosh…I do have to try this. I’m missing some of your sweeter recipes, since you went on the sugar-free wagon, and I have a huge sweet tooth. Savory is great, but sometimes I just want a good ol’ chocolate cake, you know? Anyway, this is the first savory recipe I’ve seen from you in a few weeks that I MUST try. I can’t stand how good it looks. I have to have it! And…ummm…the whole aunthenticity issue of is-this-actually-Brazilian? I don’t care. I’m gonna stuff my face either way. Thanks for sharing. Thanks Jamie! I hope you like it! This one looks delicious. We can’t want to try it. This looks amazing! 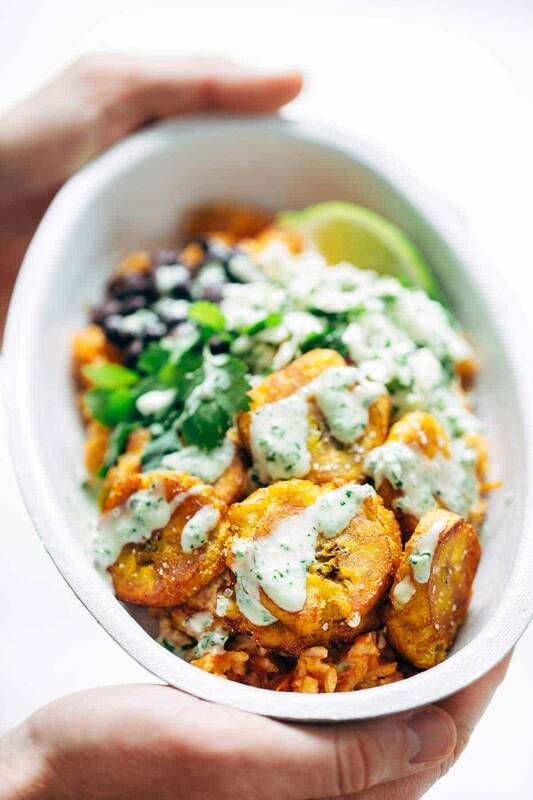 I love that you added in fried plantains – definitely a unique twist on a regular burrito bowl. And that bowl alone is making me crave Chipotle **addicted** :). Mmmmm. My mouth is watering. Making this tonight! awesome! hope you liked it Katherine! This looks like rainy day+couch+remote+blanket+romantic comedy type of comfort food I love!! Yum! Wow. you and I are twins. 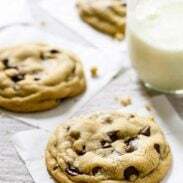 You should reach out to Joy from joythebaker.com! She lives in New Orleans. Talk about a great food-blogger meet-up! So perfect! Thank you Anne!